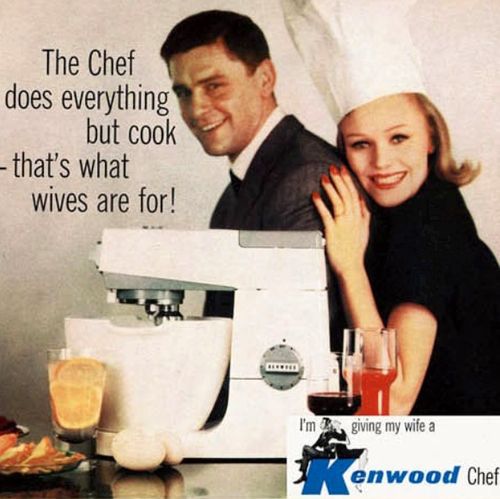 This week we take another nostalgic look back to decades past and the clever advertising of kitchen appliances. What wife wouldn’t be absolutely thrilled to receive such a thoughtful, personal and loving gift as a kitchen mixer? Not because she loves to cook – because that is “what wives are for!” – but because it will make her cooking for him even better. We are sure there are certainly women who would have been thrilled with this appliance, the latest and greatest, but maybe not as a gift. Let’s face it, no matter how much we might love doing it, cooking is a chore – thank goodness no longer the purview of women only! – and what woman wouldn’t really prefer something personal and not work-related? Today, kitchen and household appliances are the kind of item a woman buys for herself – whether by necessity or desire. Fortunately, there are so many shopping online Australia options for browsing and getting just what you want. And doing it yourself, he has no excuse to surprise you on your birthday, wedding anniversary or Christmas with an appliance to keep you in the kitchen! Visit www.ozwebrewards.com.au and browse our great range of homeware merchants – shop via our site and be rewarded with just what you want. Customer Loyalty Schemes: is the “best” really so great? A recent survey conducted by B&T – “Australia’s leading title for advertising, marketing, media and PR industries” – investigated consumer behaviour where loyalty programs are concerned. The findings were interesting. Of 1000 Australians surveyed, a vast majority (37%) nominated Coles’ Flybuys program as the best, followed by Woolworths Everyday Rewards (22%), then Qantas Frequent Flyer, MyerOne, Priceline, Virgin, and others. 88% of those interviewed stated they belonged to a loyalty program, with 46% confirming their loyalty to a particular brand was enhanced by belongingto such a program. Hence, having a rewards or loyalty program is a proven method of building a customer base for a merchant. 77% of respondents believe that points-based programs allowing redemption of points for vouchers or goods are very important. This is exactly what OzwebRewards offers. To quote B&T, “One young male respondent from Tasmania said: “Offers that have an immediate discount are better than non-tangible and confusing schemes such as points.” .” With OzwebRewards’ automatic tracking system, for which the majority of our listed merchants are compatible, rewards are fast and easy to redeem from our rewards store. More than 80% of survey respondents greatly prefer personalised email as the communication channel by which the program contacts members: OzwebRewards sends out a monthly newsletter by email, personalised to each and every one of our members. As stated in a previous post on this blog, based on our own research, we have shown that OzwebRewards’ program is by far superior to that of Flybuys. With a generous 5% reward value given for every purchase across our wide range of over 75 listed participating merchants, and the option to pool points for redemption anywhere throughout our rewards store (and every merchant can list up to eight, regularly updated reward products), there really is no better option than to participate in our amazing program. Visit www.ozwebrewards.com.au today and browse just what we have to offer. Joining is free, points never expire, and you will be supporting Australian online businesses and merchants every time you shop via our site. These days we tend to look back nostalgically at the 1950s, ’60s and ’70s as a simpler, more innocent time. A time without the trials and tribulations of everyday life which are de rigeur today – the internet, the fast pace of the everyday, the glass ceiling, the want-it all keeping up with the Joneses in which everyone is expected to participate … but were the old days really better? Or were people conditioned differently to expect less and tolerate more? This classically sexist advertisement from the late 1960s/early 1970s is for Canadian Club Whisky. It tells the reader that Dad was a man of the world before he had Mum – even being a little, shall we say, free with his affections. But be proud! Because he did it all while drinking Canadian Club Whisky Cocktails. Obviously this was a winner in the commercial stakes in its time. How would it go down today? At first glance, it may be difficult to tell just what is being advertised here. Well, the answer is … men’s trousers. 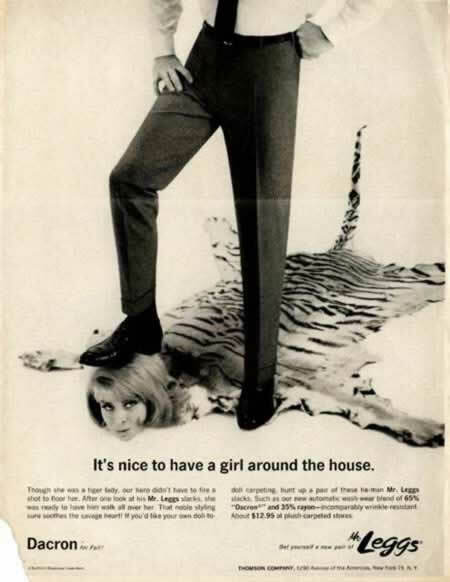 This advert from 1970 brings the metaphor of men walking all over women (in the home, workplace, and society in general) into reality – and obviously it was deemed perfectly acceptable at the time. The fine print at the bottom notes: “After one look at his Mr. Leggs slacks, she was ready to have him walk all over her”. Wonder if any women actually purchased these trousers for their men? Goodness knows none would sell with this kind of advertising today!